Bridgestone Dueler H/L Alenza tires are ideal for drivers of crossover, sport utility vehicles and light duty pickup trucks. As a high performance all-season tire, this Bridgestone model utilizes the latest in tire technology to provide a tire that not only performs well in all conditions, but does it with a high level of comfort as well. All models of the Dueler H/L Alenza feature Bridgestone’s unique UNI-T technology that enhances comfort and stability on dry or wet road surfaces, but select sizes incorporate Bridgestone’s all new UNI-T AQ11 technology. This newest tread technology features a dual layer tread compound that prevents the rubber from hardening after thousands of miles of wear. The longer you drive on the tire an extra layer of high grip rubber is exposed to create somewhat of a new tire tread. The results are impressive as the tire gives increased grip and performance in wet weather, as well as improved cornering and traction on dry surfaces. The symmetrical tread pattern on the Bridgestone Dueler H/L Alenza is designed to reduce noise and give you a much more comfortable ride. The larger shoulder blocks and center ribs on the tire provide improved stability and steering response. Circumferential grooves, along with the lateral groves and sipes increase grip on wet or snow covered roads, giving it true all-season performance. Inside the tire you’ll find twin steel belts strengthened by a spiral wound nylon wrap (for H-, V- as well as W speed rates sizes) that give the tire increased support and added stability at higher speeds. 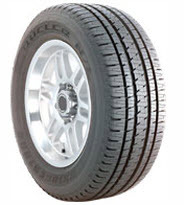 Overall, the Bridgestone Dueler H/L Alenza is a quality performance all-season tire. It features some of the newest tire technology that combine provide excellent stability and response in all types of road and weather conditions. With a solid tread warranty it offers good value for the dollar. Prices on the Dueler H/L Alenza range from around $156 for the 15 inch series tires to approximately $285 for the larger 22 inch series. Get the Bridgestone coupon below (if exist), or find all other printable tire discounts. Who Are Bridgestone Dueler H/L Alenza Tires Designed For? Bridgestone has developed the Dueler H/L Alenza for SUV’s, crossovers and light trucks for drivers who want an all-season tire that not only offers high performance traction and stability, but also rides comfortably and comes with an excellent tread warranty. Bridgestone warrants the Dueler H/L Alenza with a 5-year or 65,000 mile (or 40,000 miles for the W rated) tread life guarantee. Tire uniformity is guaranteed for the first 1/32 inch of wear as well. Materials and workmanship are backed for 5 years and include a free tire replacement for the first 3 years of wear. Bridgestone then prorates out the amount for the remaining time period until there is less than 2/32 inches of useable tread depth left on the tire. Subscribe to get fresh coupons and updates to your email inbox. Cheap Tires - Who Has The Lowest Prices On Tires?